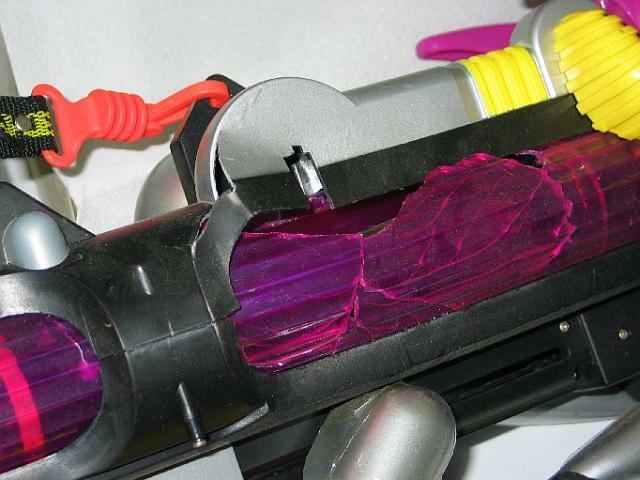 Parts of the water gun's case are cracked or faded. In the case of cracks, depending on how bad the cracks are, you may have to only epoxy the cracks back together. If the case is destroyed in some parts, please take pictures and post at our forums about it. If the pressure chamber case is broken as in the image above, you will have to replace it with a pipe or sheet of some kind rolled into a cylinder. If the paint is faded, simply repaint the faded areas or do nothing, because faded colors don't affect performance.